"Eat like peasant, live like Royalty"
Every meal should fill us with joy. We need to remember that the food we eat will soon be a part of us. It will be absorbed by our flesh and blood and bone, it's life force will become ours. We can no longer pretend that our eating habits aren't putting us in danger of a definite risk for disease. Even affecting the quality of our life. We need to be better informed on the nutritional value of what we consume. Just remember, heart disease, cancer, stroke, hypertension, kidney and liver disease, osteoporosis, depression, type 2 diabetes are all caused by eating the wrong things. The choice you make right now creates the next moment you will encounter. It's really not that complicated. Consume only food that feeds you with nourishing vitamins, minerals, plant proteins, fibers, enzymes, antioxidants, good fats etc. Try to eat something raw with every meal. 70% raw-30% cooked is a good rule to follow. Raw foods help our cells stay hydrated. Steaming and sauteing veggies are the best way to prepare if cooking. Tomatoes when cooked produce a higher release of lycopene then when consumed raw. Don't just get stuck in a rut eating the same thing all the time. Eat the rainbow of colors in different fruits and veggies and try to eat what is in season ( also less expensive). Nature provides us with the nutrients we need at the right time of year when we need them. 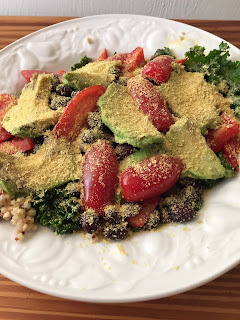 In a bowl top the kale with quinoa, black beans, sliced avocado, a hand full of sliced cherry tomatoes and season with nutritional yeast. "A Bean, a Green and a Grain"